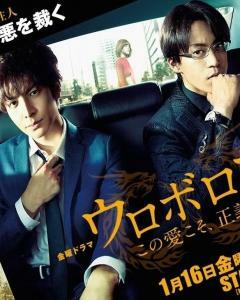 Cast: Oguri Shun, Ikuta Toma and Ueno Juri. Growing up as orphans Ryuzaki Ikuo and Danno Tatsuya never had a place they called home, until they arrive at a children’s home run by Kashiwaba Yuiko (Hirosue Ryoko). The two grow very fond of Yuiko, due to her caring personality and big heart, and start seeing her as the only adult they trust. Everything changes drastically when they one-night witness four men leaving a bleeding Yuiko, after shooting her. This leads them to vow, to find the men, take revenge, and kill them. Several years later, they both are grown: Ryuzaki Ikuo (Ikuta Toma) is a detective with a perfect arrest record, and Danno Tatsuya (Oguri Shun) is a don in the underworld. Waiting for opportunities and clues to find the assailants behind Yuikos killers. After an alleged suicide, Ikuo arrives at the crime scene and becomes the partner of Hibino Mizuki (Ueno Juri). Soon they find out that the suicide isn’t a suicide, and suddenly the clues start dropping. This is one of the few revenge dramas that I’ve enjoyed in my 10+ years of watching dramas. It is a typical drama meaning a tiny bit cliché, but with good twist - had me wondering a few times. I like that it was delivered as it is, and was not apologetic about its characters. We were made aware from the beginning how things are, and how the situation will be. And yet we are wondering at the end, if there might be a better life for these guys in the future. This is as said one of the few ‘revenge’ dramas I like, and funnily enough it once again stars Ikuta Toma (the other revenge drama I enjoyed is Maou in which he stars in). Oguri and Ikuta are amazing actors, so the duo is actually perfect in almost every sense. At first, I didn’t really understand Ueno Juri had to be in it - they didn’t use her characters potential at all, but she is interesting to watch, and a great actress, so it’s not a complete waste. To sum up: a great drama with good plot and great screenplay. Recommendable!